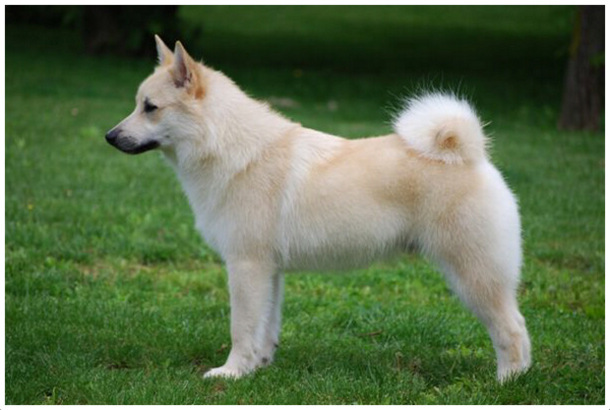 This is a Spitz-type medium size herding dog breed. Similar to the Spitz-type dogs, these dogs are also characterized by their prick ears. They have a foxy face and a thick coat. The dogs have a long tail that curls over the back side of the dog. This energetic dog breed has a sturdy and a compact boy. The eyes have an oval shape. The inner coat is very soft, and the outer coat is very harsh and rough. 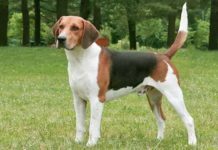 This breed of dog is considered as the best family dog breed. 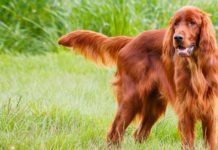 This is a very active and an intelligent family dog breed. This herding breed of dog has a long history. These are the all purpose dogs that have been used for guarding, herding, and farming. 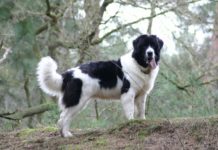 The history of these dogs goes back to 900 AD. 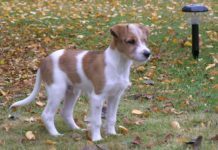 Until 1920s, this dog breed was only known in Norway. Due to the efforts of John Saeland, this dog breed was promoted. With the end of Second World War, Norwegian Buhund reached in England. 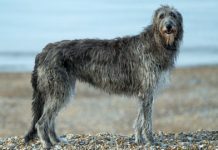 In 1968, these dogs were recognized by the British dog history. This breed was also extorted to many other countries including United States. In different police works, these dogs have also been used in the past. 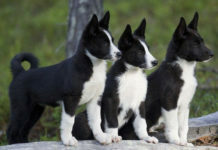 In 2009, this breed was added to the group of herding dogs group. These dogs are healthy and have a life span from twelve to fifteen years normally. 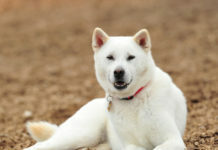 Some diseases are common in these dogs that affect the life of this dog breed. These common diseases include hip dysplasia and cataracts. This medium size dog breed is full of energy. These dogs are very enthusiastic. 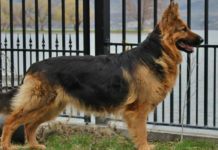 These medium size herding dogs are very affectionate and confident. These are also very social. Being so loyal, these herding dogs are the excellent watch dogs. 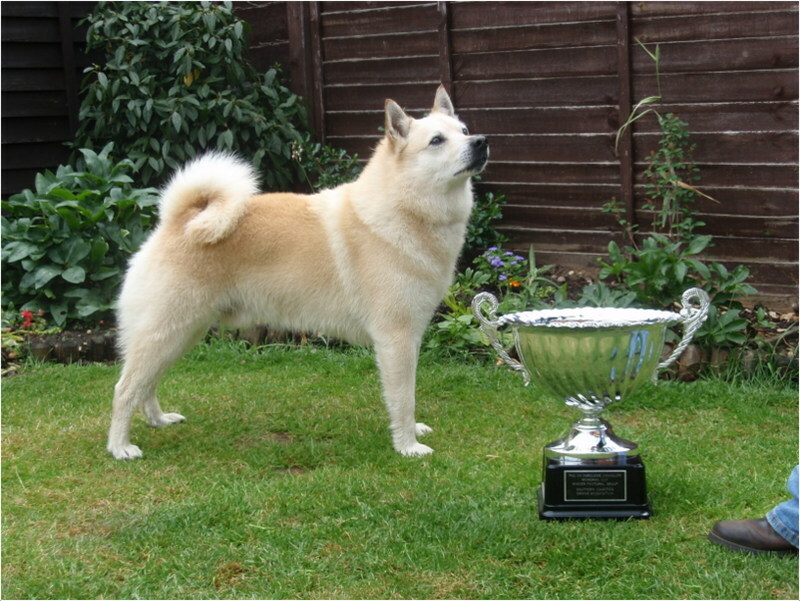 The dogs have a loud bark and enjoy taking part in different sports and other activities. This breed of dog is a very dutiful breed. 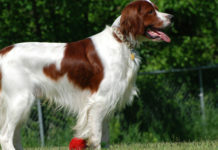 These dogs are very energetic and have an athletic body. They are always eager to perform various activities throughout the day. 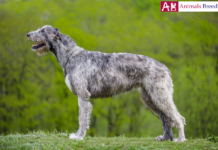 This dog breed has a strong stamina, and it is known for its competitive nature. They eagerly take part in different sports. They are so energetic that even they can do work all the day long. To get relaxed after a long hard work, they like to sit in the feet of their owner. 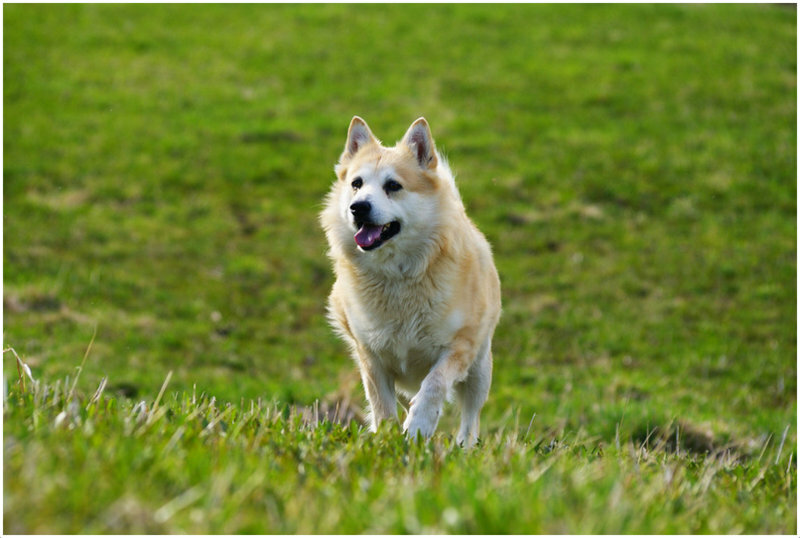 These active dogs are very smart and can adapt easily to changing environments. This medium size breed learns everything quickly. They listen to their masters at once and show their dutiful nature. In competitive sports, these dogs have always been the successful dogs. Due to their alert, competitive, quick, and dutiful nature, these are used for performing different police works. These dogs are very smart and love to have social bonds. Another behavioral trait of this medium size breed is its loyalty to the family. These dogs are very strong and fearless and make great efforts to adapt themselves to different changing environments. These dogs get along easily with the kids, cats, and the other dogs. They really like to take part in different family activities. Because of their activity and alert nature, these have been used as the watch dogs. These dogs are very obedient and are still used in police work. These dogs have a medium size. 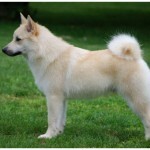 The characteristic of these dogs are similar to the characteristics of Spitz dogs. They have a curled tail and pointed ears. They have dark and gentle eyes and warm expressions. 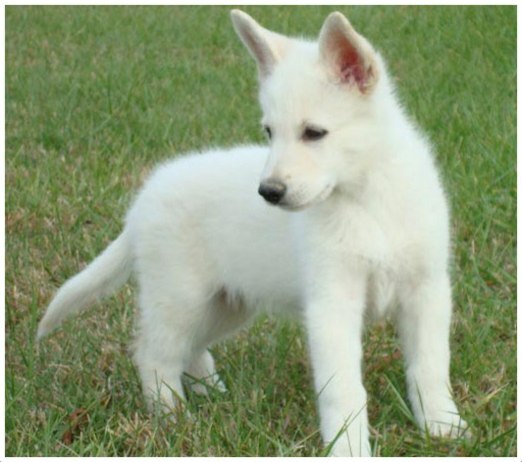 Their ears are very large and moveable and the body has a square shape. These best watching dogs are medium in size. 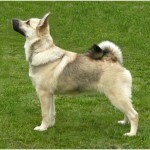 Height of a male Norwegian Buhund is 17-18.5 inches, and the height of a female Norwegian Buhund is 16-17.5 inches. 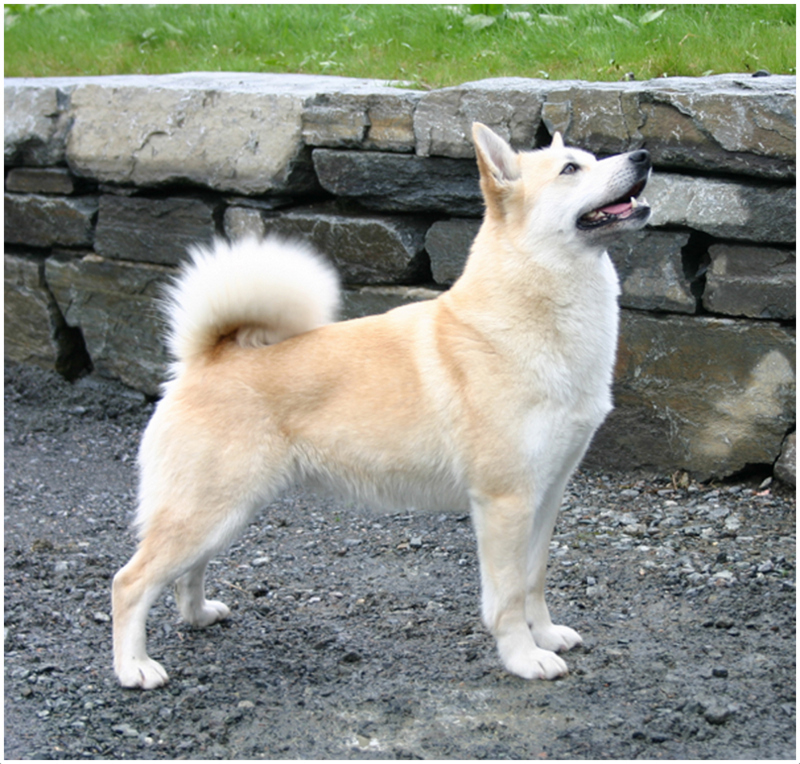 Weight of a male Norwegian Buhund is 31-40 lbs, and the weight of a female Norwegian Buhund is 26-35 lbs. The dogs have an inner and an outer coat. The inner coat is very soft and outer coat is very harsh and stiff. These medium size herding dogs are found in red wheaten, black, and wheaten colors. This breed has heavy shedding. Because of heavy shedding, these dogs have very high grooming needs. For good grooming, you should brush the coat of your dog regularly. Regular brushing will keep your dog maintained. In shedding season, daily brushing is required for good grooming. 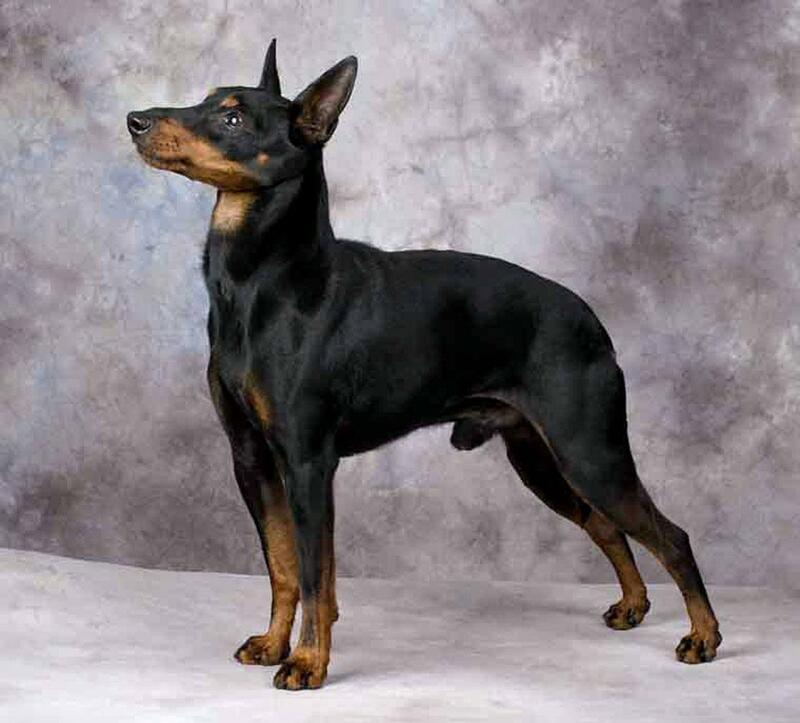 The dogs have a strong, sturdy, and a muscular square shape body. They have mobile ears and dark eyes and a well defined muzzle. They have a medium length and an average body coat. The dogs indeed have an appealing and an interesting look. A Norwegian Buhund is very friendly with the kids. These herding dogs are also very friendly with the cats. 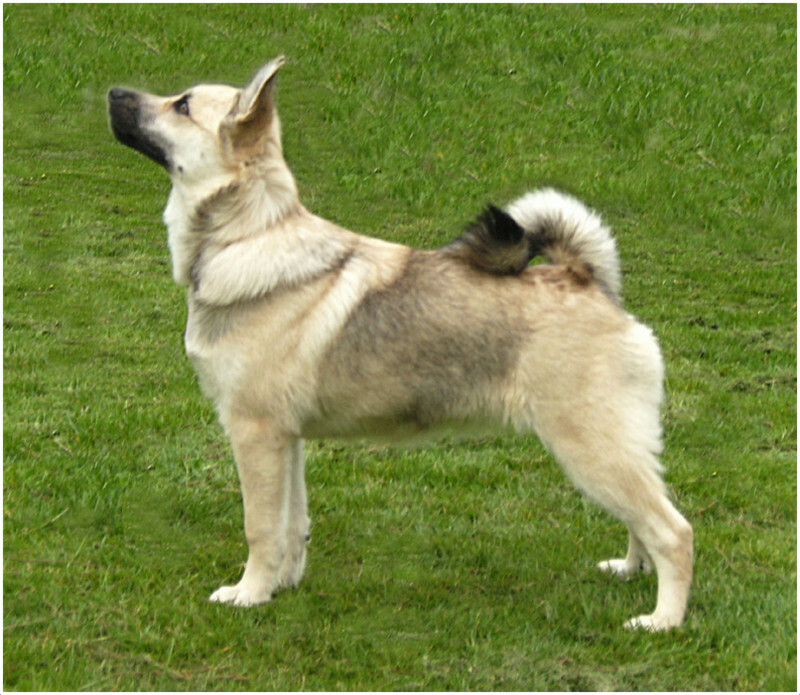 A Norwegian Buhund breed is also a dog friendly breed. It is quite easy to train a Norwegian Buhund. These dogs have heavy shedding. A Norwegian Buhund is the best watch dog. These herding dogs are very intelligent. 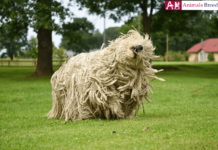 This herding dog breed has average grooming needs. 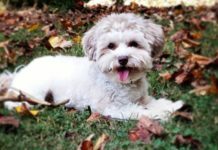 These best family dogs are very popular dogs. These dogs have high adaptability. 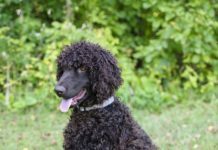 This best family dog breed is not hypoallergenic. The dogs have a long curled tail resting on their backs. Their barking is very vocal and loud. These are also very cheerful and have social manners. These do not need too much care. 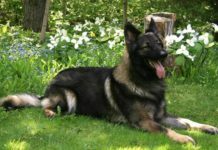 Different hip and eye problems are common in this breed. For their good care, owner should give them weekly bath and regular brushing. Frequent checkups are also important. Regular exercise is also very essential for their good health. These are the excellent watch and working dogs and are always ready to take part in different activities. Therefore; the feeding requirements of these dogs are also very high. For maintaining good health of your dog, give your dog at least three to four meals a day. 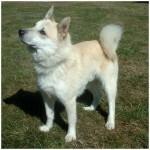 Full name is Norwegian Buhund. 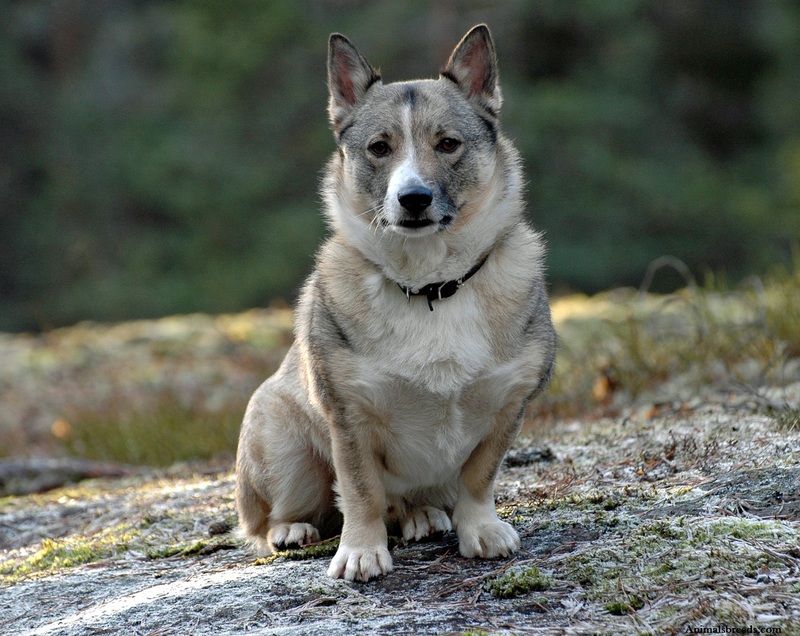 Other names are Norsk Buhund, and Norwegian Sheepdog. 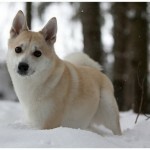 Origin of this dog breed is Norway. It is a medium size dog breed. 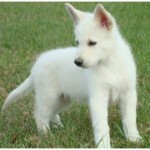 It is a herding dog breed (AKC). 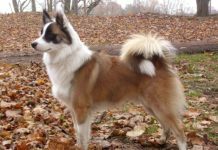 Life span of this herding dog breed is 13-15 years. 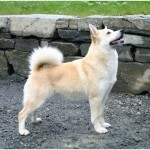 Height of a male Norwegian Buhund 43-47 cm and the height of a female Norwegian Buhund is 41-45 cm. 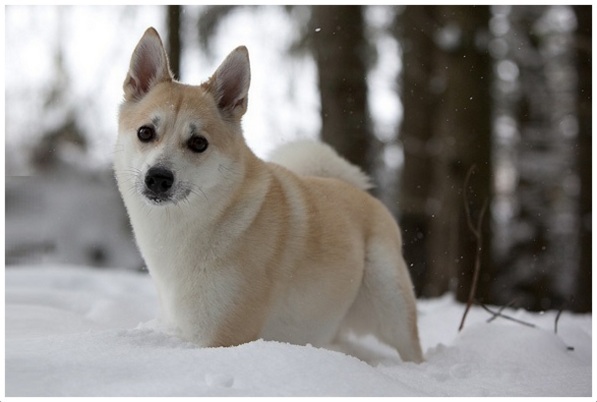 Weight of a male Norwegian Buhund is 14-18 kg, and the weight of a female Norwegian Buhund is 12-16 kg. 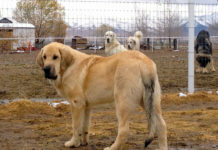 These medium size herding dogs are found in red wheaten, black, and wheaten colors. Average puppy price is $13 to $15. Daily sleep time is 6-8 hours. 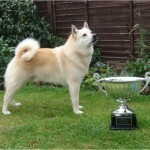 Norwegian Buhund is the best family dog breed.